Tokyo is arguably the most varied, creative and stimulating retail experience in the world. Not only is the city huge, but each area has a distinct feel and atmosphere, reflected in its shopping. There are small, niche brands everywhere, as well as workshops and artisans. Many of those are unique to Japan, but even the designer brands up their game – often with striking stores and developments. There are simply too many to list here, but these 15 should provide a good starting point for the sartorial shopper. And as with previous guides, we have focused on stores that are pretty much exclusive to Tokyo. I recommend looking up the various stores on the map and grouping them into areas: the size of Tokyo means it could take a while to get from one area to another. And once in an area, whether glitzy Ginza or funky Daikanyama, take the time to wander around and see what else pops out. You might wander into Tsutaya books, for example, and end up whiling away most of the afternoon. It’s also worth saying that unlike London, most bespoke artisans are in small studios on the first or upper floors of buildings. They don’t have a storefront, as they usually don’t offer ready-to-wear, and you should try to make an appointment in advance. Department stores in Japan do things very well, from the brand mix to the merchandising. But the thing that will set them apart for most readers is the presence of bespoke and made-to-measure clothing, from all around the world. Isetan is worth seeing for the pure department-store experience, but also make sure to visit the made-to-measure area, and look out for any trunk shows going on at the time. Oh, and there’s a whole building just for menswear. Strasburgo takes this a step further. With a more select range, and slightly more sartorial approach than the other department stores, it has several branches around the city. I recommend the Minami Aoyama branch, for both the RTW selection and the Tailor’s Lab that was established here on the third floor a couple of years ago. There you will find a workshop housing artisans such as shirtmaker Masanori Yamagami and tailor Noriyuki Higashi (Sartoria Domenica). Trouser-maker Igarashi also started out here. Beams is also a smaller, more curated store (or rather, series of stores) and is worth visiting for both the taste level and the comprehensiveness of great American and European brands. It never fails to depress me how many great Italian brands, for example, don’t get stockists in London. New York is better, but Tokyo is the best. Both stores mentioned here are worth a visit: Beams F for more sartorial European brands, and International Gallery for more casual and designer clothing. Compared to the stores above, Tomorrowland is more fashion-focused, but the men’s side tends to be fairly classic and have some interesting variants on menswear staples. It carries its own brand as well as range of others, including Acne Studios, Dries Van Noten and James Perse. It also opened a branch in New York’s Soho a couple of years ago, so is no longer exclusive to Japan. 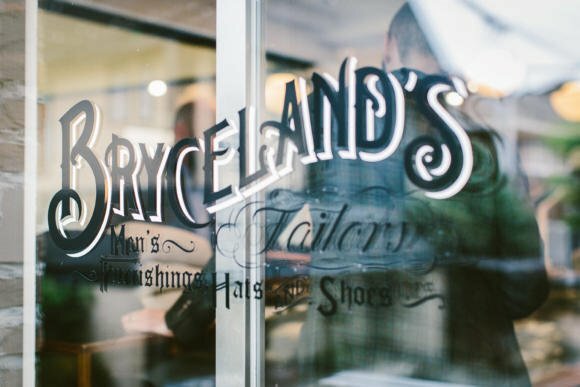 Bryceland’s Co is a niche menswear store opened in 2016 by Ethan Newton, one of the founders of cult menswear store The Armoury in Hong Kong. It mixes soft Italian tailoring with American workwear, with a good deal of vintage pieces to purchase as well. Ethan has a very particular outlook on both design and fit, with jackets tending to be large in the sleeve and chest to give a classic, masculine look. Also worth highlighting are the Saint Crispin’s shoes and Ambrosi trousers. Tailor Anglofilo works out of the back. Japan has a huge number of bespoke shoemakers, perhaps more than the whole of Europe combined. They are largely young, working in small workshops, and good value for money – though the small size can mean there are long waiting times. Most importantly, their quality is amazing, often excelling those European masters they learnt from. There are too many to try and recommend any specifically, but it is certainly worth trying to see Yohei Fukuda and Shoji Kawaguchi, the latter operating under the brand Marquess. There aren’t quite as many new tailors as shoemakers in Japan, but the quality of the work is still very high. They are largely influenced by the soft tailoring of the south of Italy, although some also trained in Florence or Milan. English influence is felt only in the older, more traditional tailors. Noriyuki Ueki, who runs Sartoria Ciccio, trained in Naples and cuts a soft-shouldered suit with a Japanese level of precision. He moved into new, larger premises last year, where you can also see the shoes of Hidetaka Fukaya, a Japanese shoemaker who works out of Florence, Italy. There are a couple of workshops making only bespoke trousers worth highlighting: Igarashi and Osaku. Of these two, Igarashi is in the centre of Tokyo and is therefore easier to visit. Osaku works from a small town outside of the city, and comes in for appointments. There is a similar level of precision to their work as there is with the rest of Japanese craft, and a focus on details such as curved waistbands and neat pick stitching. Of the bespoke menswear craftsmen listed here, leather master Naoyuki Komatsu probably has the most stellar reputation. He runs a small workshop called Ortus, which does 90% bespoke pieces such as day bags and wallets. Everything is entirely hand sewn – in fact, Komatsu even goes as far as to make the brass hardware himself, crafting these additions small works of beauty in themselves. Trade mark designs include the ‘music bag’ – a briefcase made of one piece of leather with a brass bar securing the single handle. 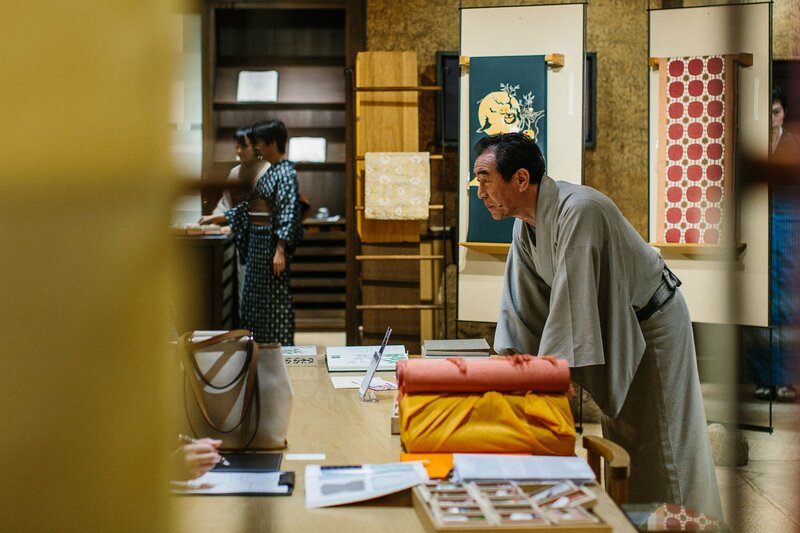 Those wishing to see traditional Japanese craft in Tokyo should consider visiting Motoji, the most famous of the kimono makers in the city. Although none of the work is done on-site (fabric is produced all round Japan, and tailoring done outside the city), the shop, its bolts of cloth and finished kimonos are a virtual museum of craft in themselves. Keita Motoji, son of founder Komei Motoji, is doing much to increase awareness of both Japanese kimono traditions and the weavers they use in different parts of the country. Shifting our focus from tailoring to workwear, Okura is a great stop for anyone that loves indigo-dyed clothing. 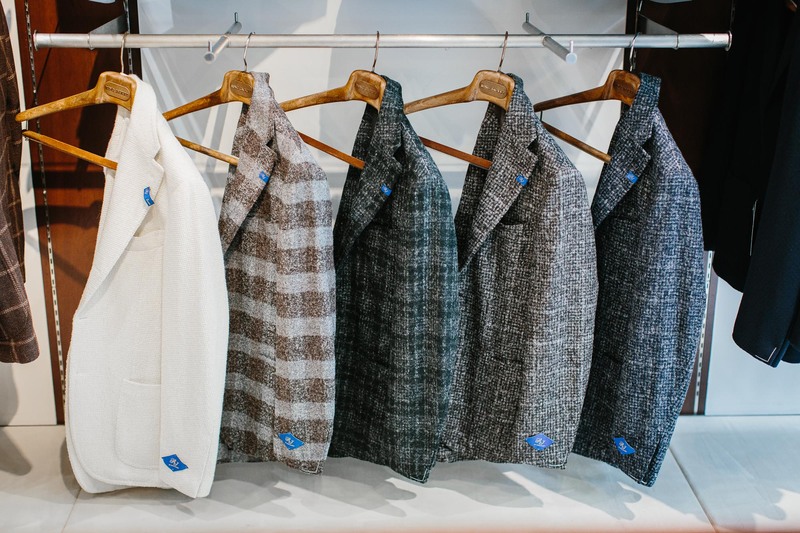 The shop in the Daikanyama area of Tokyo is stocked floor to ceiling with indigo-dyed jackets, T-shirts, sweatshirts and kimonos, both from brands like Blue Blue Japan and cheaper variations not made domestically. Look out for pieces in sashiko cloth in particular. Specialist pieces include western shirts, deck jackets, chinos and T-shirts made from a mix of standard organic cotton and Desi cotton. Make sure to take advice on sizing, as pieces can be either ‘shrink to fit’ or made to grow out with wear. This is largely included for the beauty of the shop itself, although I’m sure there will be fans of 45 RPM’s denim and workwear that want to visit the mothership as well. Located in a largely residential area of Tokyo, the store is up a small path that is easy to miss. At the end is a wooden Japanese home, raised off the ground, that you have to climb a steep set of stairs to access. Inside customers must take off their shoes (as in some other Japanese stores, or changing rooms), don slippers and browse the handful of beautiful rooms. There is both men’s and women’s clothing, mostly with an influence of denim and indigo dyes. Ring Jacket is the first Japanese tailoring brand to have achieved serious recognition around the world, largely thanks to the promotion of The Armoury in Hong Kong and New York. There are two stores in Tokyo, in Ginza and Aoyama, and it is also stocked in Isetan. The style is Italian and soft-shouldered, although there is a range of models (a decent reason to visit one of the standalone stores rather than just Isetan) and they also offer accessories and leather goods, all with rather Italian styling as well. The tailoring is well made and good value, particularly in Japan compared to imported Italian brands. Arts & Science is a small chain of stores in Tokyo founded by stylist Sonya Park. It is an interesting crossover between Japanese crafts and modern, minimal sensibilities, with accessories, menswear and womenswear. Although the clothing offering is pretty small, it is a good place to find unusual (if expensive) homewares and accessories, in simple styles and colours. Look out for loose linen jackets, wooden boxes and leather pouches. We recommend both the Aoyama or Daikanyama branches. You can follow the discussion on Tokyo: A sartorial shopping guide by entering your email address in the box below. You will then receive an email every time a new comment is added. These will also contain a link to a page where you can stop the alerts, and remove all of your related data from the site. If one is more than six feet tall then these stores a mostly off limits. Very interesting roundup, thank you! Notwithstanding the flexibility offered by bespoke, are there RTW sizing options for taller, wider western frames in Japan? There is a probem with Asian sizes for tall westerners – like me – for anything off the peg, but this is not a problem in many of these stores which have alteration tailors on hand, e.g. Brycelands. The bespoke shoe market is probably the most interesting aspect of Tokyo menswear – a veritable boom. I ordered a pair from Yohei Fukuda in March and was very impressed with his operation, and level of service. We spent an hour discussing shoes, and other matters, in his charming atelier. I imagine the finished product will be very special indeed, and at around half the price of Lobb, Cleverley etc, could be considered a bargain. By the way Simon I am working on an article for the Japan Times about Fukuda and the bespoke shoe scene here, and Permanent Style will get a mention. If it’s published, of course. I find the problem for the western man shopping in Japan is not so much height as breadth of chest and shoulders. I am only 5’10” and 73 kg, but anything other than XL is too narrow across my chest and shoulders. Couldn’t agree more. At 185cm and 90kg, my choices here in Japan are heartbreakingly limited. 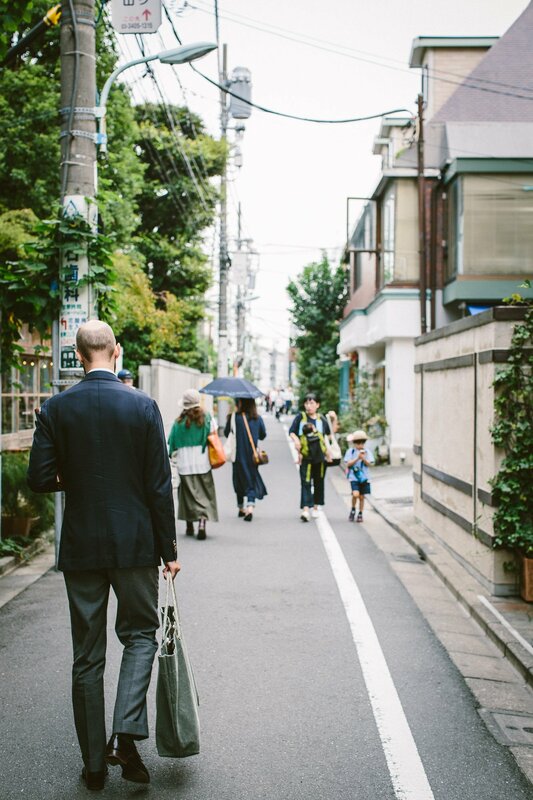 I couldn’t agree more that Tokyo is just the best city for menswear worldwide. It is especially even more true for smaller guys like myself (5’9″) where small sizes are plentiful. I particularly loved the many concepts at Beams and United Arrows. The selection is very different based on which shop you visit. Beams Ginza and Beams Marunouchi don’t have at all the same vibe. And as for United Arrows, the Sovereign House store in Ginza is rather impressive I’ve found. Sovereign House is in Marunouchi, and despite Simon’s note, it isn’t a department store. It’s a brand of United Arrows — a “select shop” in Japanese retail parlance. You’re right, of course. Part of the confusion is that department stores used to have actual departments, rather than being collections of brands, but few are anymore. And of course a select shop in Japan is a boutique carrying a collection of brands. I guess today ‘department store’ indicates scale more than anything else. MTM is the way to go in Tokyo. Beams, United Arrows, Tomorrowland, Strasburgo, Isetan Mens, Hankyu Mens, and Azabu Tailor and its many imitators will do you very good MTM in any fabric on earth, in less than a month, at a small markup over RTW — making it a sin to buy RTW at full price. True bespoke is hard to find, expensive (everyone clocks in right at $4,000), takes forever (6 months), and you can’t get the same access to fabrics. But you’ll get nice buttonholes. Arts & Science has some pretty out-there labels by PS standards, I would expect—I know they stock Maurizio Altieri’s m_moria shoes, and I believe they’ve collaborated with Maurizio Amadei (of MA+). Simon I notice from the comments that RTW and bespoke shoes seem well priced in Japan, can you shed any light on price expectations – thank you. Bespoke certainly is – look up my feature on Yohei, Shoji and others. All the prices are there. RTW from them is also good, but anything imported (English, Italian) is not. For some reason that I’ve not been able to fathom, Italian shoes generally aren’t so outrageously priced in Japan. Also, quite a few decent Japanese stores have private-label shoes made for them by Italian makers, and they can be both high-quality and affordable – the biggest issue will be finding your size, as many stores won’t stock much at all over a UK9. However, UK and US shoes are typically far, far more expensive in Japanese than elsewhere and so are not worth buying, unless on deep discount during sale season. Thanks Simon, though not helpful to have yen only prices. Suggest ‘at time of publication ¥300k =………’ etc. Fyi current rate is ¥100k = gbp £700. So, roughly, ¥350k = £2,450 for a pair of bespoke shoes but, as in UK does that include last, if so does second commission therefore see a reduction? I prefer not to include conversions as exchange rates change constantly, domestic prices more slowly. Yes, it includes last and no, there generally isn’t a reduction for the second pair. A music folio style case appeals to me and I wonder, does the Swaine Adeney Music Case compare with the Ortus music bag, or is the latter at a higher point craftsmanship wise? What hotel did you stay at in Tokyo? Would you recommend it? Thanks. Would be good to know which what it was so I can stay away? I can look up the details, but it wasn’t bad, just not particularly special or worth recommending. And there are hundreds of hotels in Tokyo. I recommend finding the area you want to stay in first, rather than the hotel, as it is a very big city and lovely to be walking distance to some things. Thanks. What district did you stay in? What is the price of a basic Ring Suit in store in Japan vs. online/US retailers? It seems the majority of their suits are in the ~$2000 range online and in the US retailers that stock Ring Jacket. What is the cost in Japan? Much thanks.